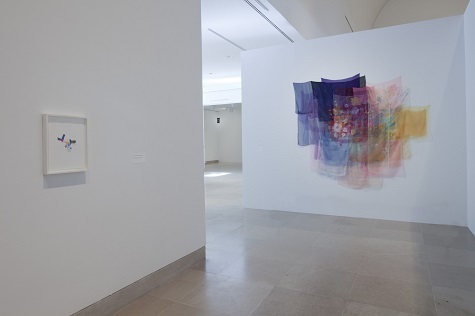 Be sure to stop by the DMA by Sunday, January 12, for a last look at Jim Hodges: Give More Than You Take. 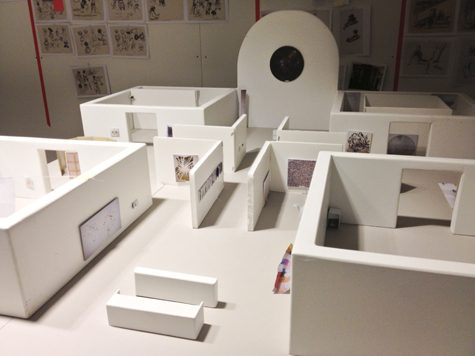 which we were excited to co-organize with the Walker Art Center in Minneapolis and to premiere in Dallas. 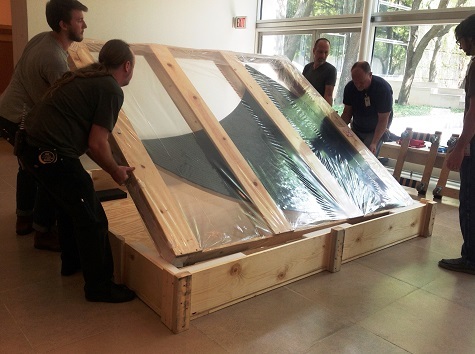 Starting bright and early on January 13, DMA staff will begin packing the artworks in preparation for shipping the exhibition to Minnesota . 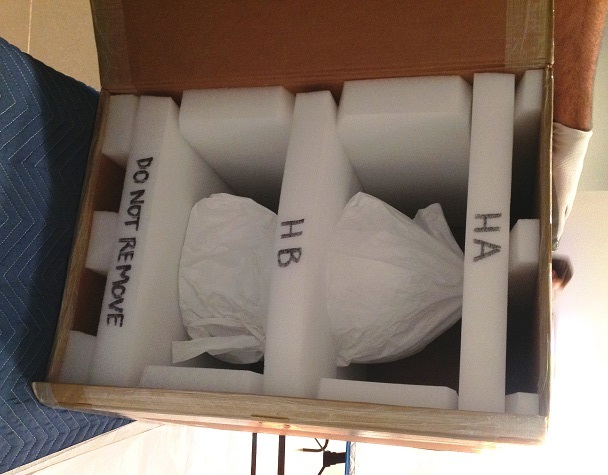 These photos showcase the careful packing methods needed for such fragile and unusual materials. 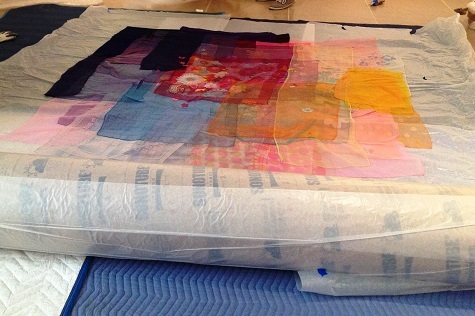 Anymore is pinned into place to prevent movement during transit, and then padded with Tyvek-covered bolsters and archival (acid-free) tissue paper. 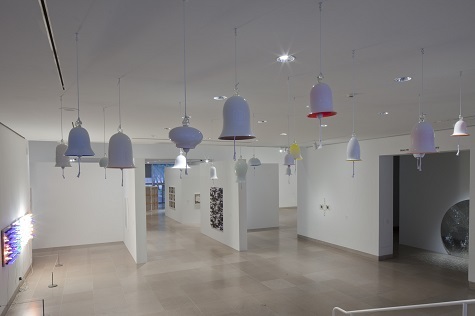 Each of the glass bells is wrapped in Tyvek and surrounded with custom-cut foam collars that fit snugly around the piece. 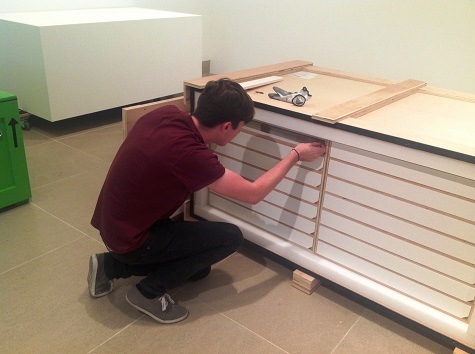 Each of the 342 pieces of the DMA’s own Changing Things artwork is pinned into its numbered spot onto a foam tray inside archival blue-board boxes. 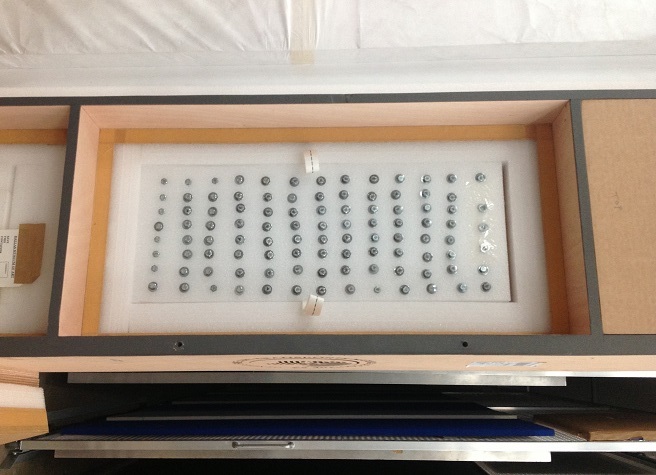 The numbers correspond to labeled holes on the plastic template that hangs on the wall for installation. 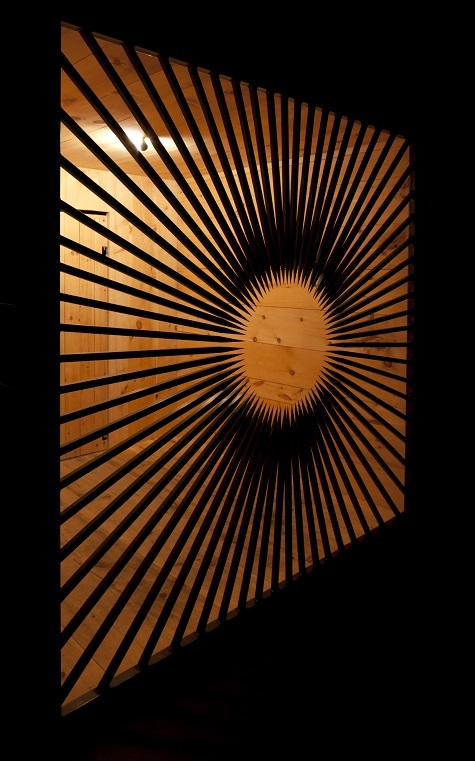 The many custom bolts that attach the sides, ceiling, and floor panels of the dark gate room are neatly inserted in parallel rows inside their crate. 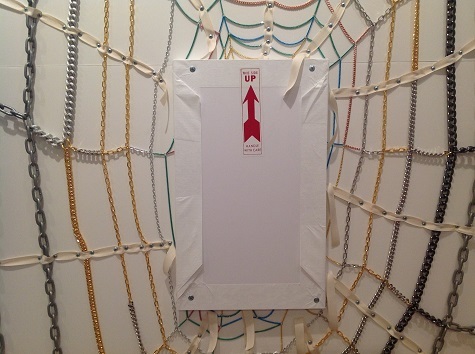 Eleven strips of twill are drilled into the foam backing of Untitled (Gate)’s crate to secure the chains for travel; the charms that hang in the center of the web are further protected by a Tyvek-covered foam sheet. To minimize the possibility of wrinkles and protect the fibers of the artwork, With the Wind is wrapped in tissue and rolled around a tube. 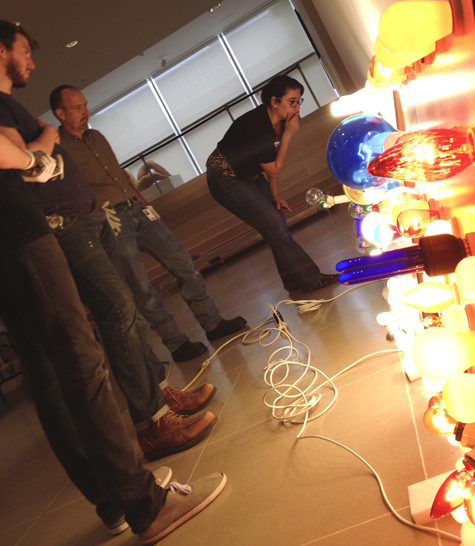 Reagan Duplisea is the associate registrar, exhibitions at the DMA. Yesterday, we observed the 25th anniversary of World AIDS Day with a screening of Untitled, a film by Jim Hodges, Encke King, and Carlos Marques da Cruz. 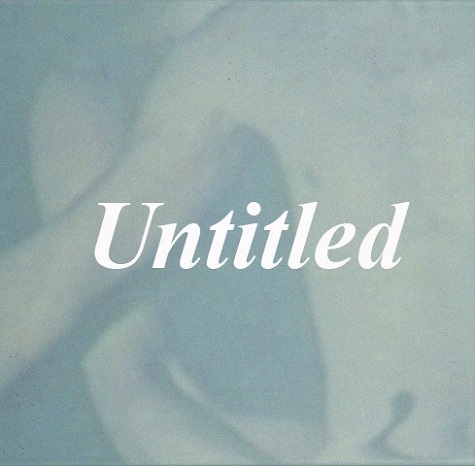 Untitled begins with a reflection on the early AIDS epidemic. Following a nonlinear narrative, the film brings together mainstream network news, activist footage, artists’ works, and popular entertainment, referencing regimes of power that precipitated a generation of AIDS and queer activism, and continues today with international struggles for freedom and expression. If you missed yesterday’s screening, don’t worry! 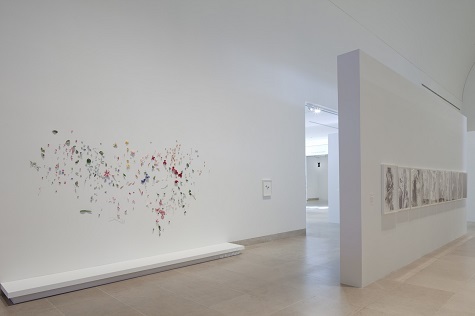 We will show Untitled again on January 11 at 1:00 p.m. And don’t miss the DMA-organized exhibition Jim Hodges: Give More Than You Take, on view at the DMA through January 12. 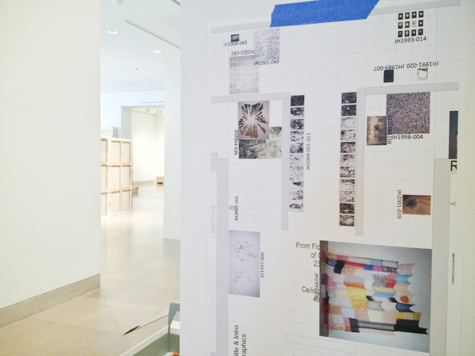 Meg Smith is the curatorial administrative assistant for contemporary art at the DMA. The Center for Creative Connections (C3) has taken the Jim Hodges exhibition title, Give More Than You Take, as a call to action. 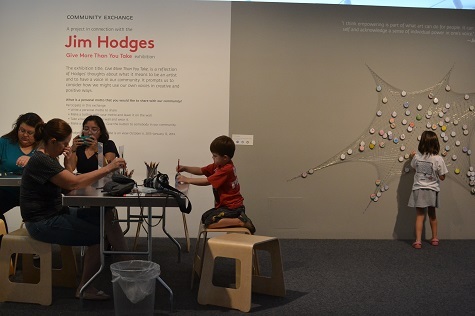 Hodges gave the exhibition this title after reflecting on what it means to be an artist and have a voice in our community. Inspired by this idea of the power of our individual voices, we are offering visitors a chance to consider how they might use their voices in creative and positive ways. 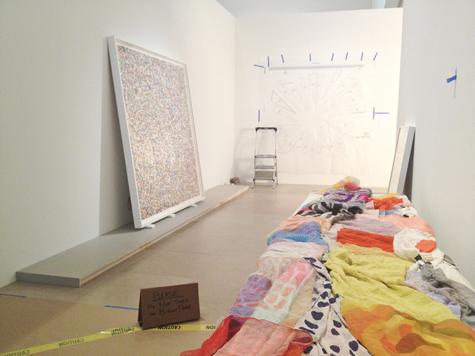 Throughout the run of the exhibition Jim Hodges: Give More Than You Take, we are hosting a Community Exchange in C3. 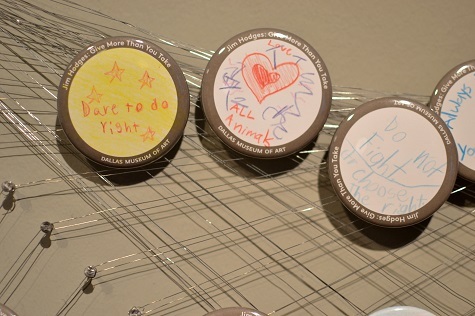 You can make a button with a personal, positive motto that you want to share with the community. Then leave the button you create on our Community Exchange wall and take someone else’s button from the wall. Wear the button you take out into the community to share a positive message. 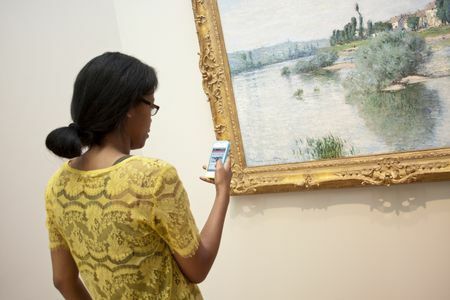 Document your button’s journey by tagging photos with #DMAGiveMore (check out our #DMAGiveMore on the DMA’s Instagram). Want to truly give more than you take? Make a positive gesture by giving your new button away to someone else. Halloween is just around the corner and it has us seeing haunting references in works at the DMA and treats throughout the Museum’s galleries. 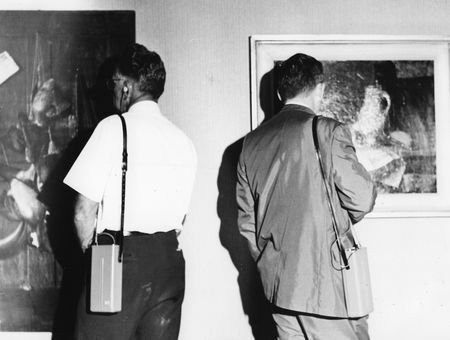 Tell us which works cause you to have a hair-raising Museum visit. 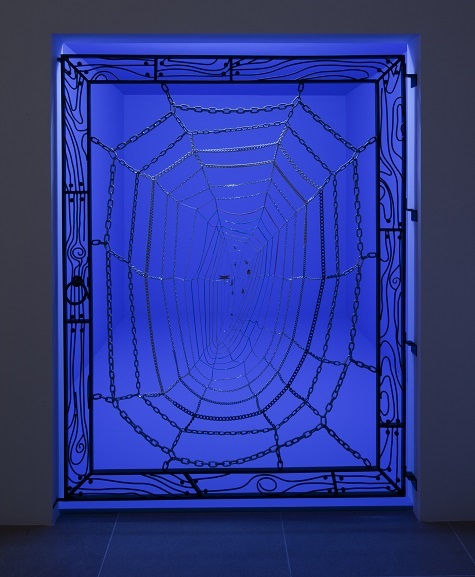 With quiet determination, artist Jim Hodges has, over the past twenty-five years, produced one of the most affective bodies of sculpture, drawing, and installation of any artist of his generation. 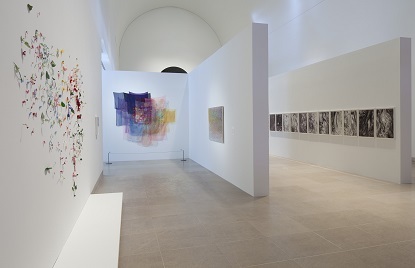 Jim Hodges: Give More Than You Take brings together works in all media–from modest objects to room-sized installations that engage the viewer in sensory experiences–to fully reveal the breadth and complexity of Hodges’ inventive vision. 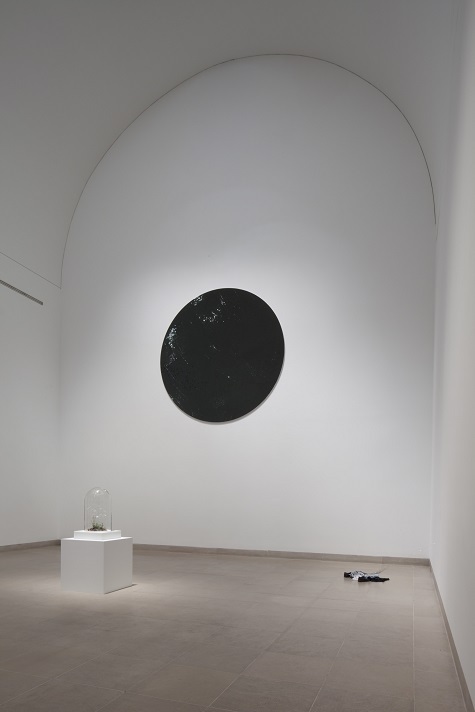 Comprising over eighty objects produced from 1987 through the present, the exhibition also includes works never before seen in the United States, along with a major new piece, Untitled (one day it all comes true), created especially for this exhibition. 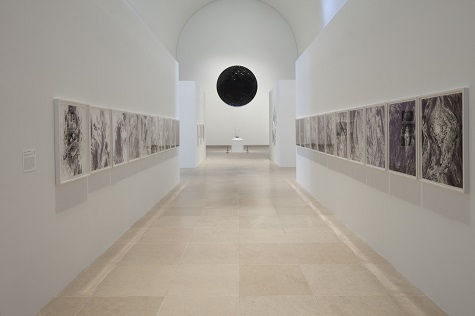 I’m proud to have worked so closely with Jim Hodges and Olga Viso, executive director of the Walker Art Center, to bring this remarkable exhibition to fruition, and I invite you to be among the first to see it at its US premiere in Dallas, before it travels to Minneapolis, Boston, and Los Angeles. Please join me in the Horchow Auditorium for a conversation with Jim Hodges tomorrow evening, October 3, at 7:30 p.m., and join us for a sneak peek on Saturday, October 5, a day before the exhibition opening. 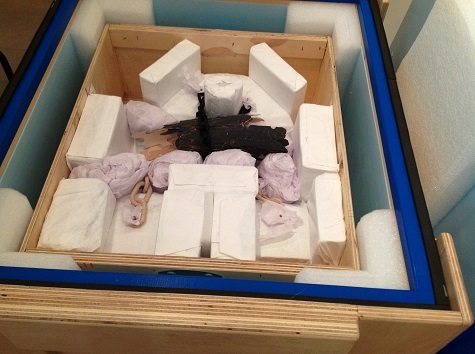 Jeffrey Grove is the senior curator of special projects & research at the DMA. We have just under two weeks until we open the U.S. premiere of a major traveling exhibition, Jim Hodges: Give More Than You Take . 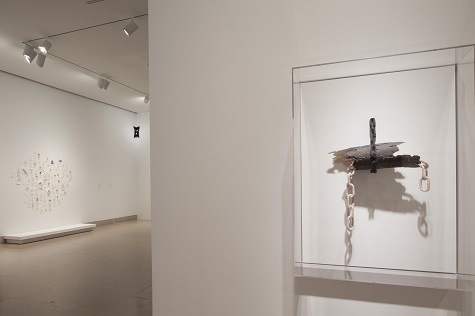 The exhibition is an exciting one not only because it is the first comprehensive retrospective of Hodge’s career in the U.S. but also because it is co-organized by the Museum and the DMA’s senior curator of special projects & research, Jeffrey Grove. 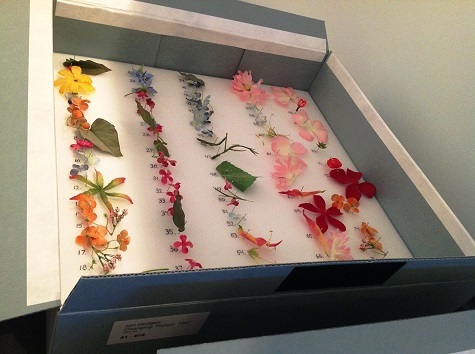 The nearly eighty works on display in the exhibition consist of hundreds of items, from brass chains to denim, from napkins to head scarves, from silk flowers to light bulbs. 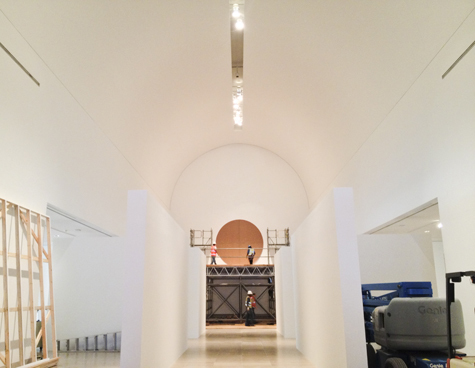 If you passed by the DMA’s Barrel Vault during a recent visit, you may have seen some of the detailed installation, which began in early September. 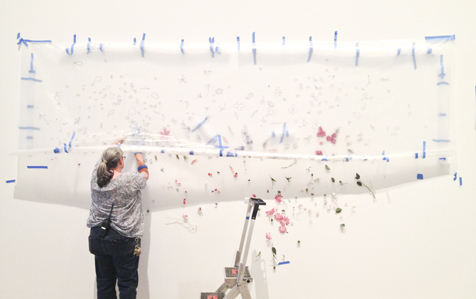 Get an up-close look at the installation below, and mark your calendars to meet Jim Hodges on October 3 during a special Artist Talk at the DMA!